For the convenience of those so much interested in the geology of this district as to desire further information, the following list of references is appended. This includes some of the papers already cited. It is not thought that this list is complete. 1868. Geology of Cook County. H.M. Bannister. Geol. Surv. Illinois. Vol. 3 - Geology and Paleontology. pp. 239-256. Springfield, IL. 1868. 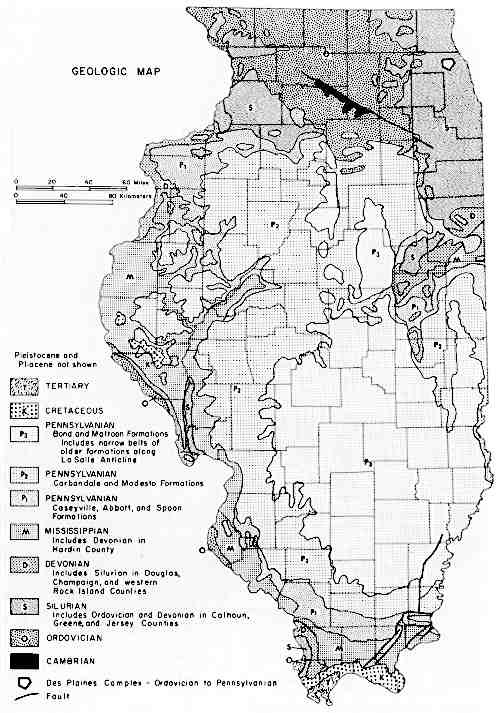 Geology of Will County. F.H. Bradley. Geo. Surv. Illinois. Vol. 4 - Geology and Paleontology. pp. 207-225. 1868. Geology of Dekalb, Kane and Dupage counties. H.M. Bannister. Geo. Surv. Illinois. Vol. 4 - Geology and Paleontology. pp. 111-125. 1868. Report on the survey of the Illinois River. James A. Wilson and William Gooding. Rept. Chief Eng., U.S.A.. p. 438. This makes reference to the former southwestward discharge of Lake Michigan. 1877. Geology of eastern Wisconsin; modified drift. T.C. Chamberlin. Geology of Wisconsin, Vol. 2, 1873-77, pp. 218-233. This gives a brief discussion of the beach formations and the evidences of fluctuation of lake level as seen to the north of this area. 1884. Microscopic organisms in the bowlder clays of Chicago and vicinity. H.A. Johnson and B. Thomas. Bull. Chicago Acad. Sci., Vol. 1, No. 4. 1886. Chicago artesian wells: on their structure and sources of supply. Leander Stone. Bull. Chicago Acad. Sci., Vol. 1, No. 8. 1888. Raised beaches at the head of Lake Michigan. Frank Leverett. Trans. Wisconsin Acad. Sci., Vol. 7, 1883-87, pp. 177-192. 1889. Water supplies of Illinois in relation to health. Prof. L.E. Cooley. Rept. State Board of Health, Springfield. 1890. Lake and Gulf Waterway. Prof. L.E. Cooley. Private publication. 1890. Survey of waterway from Lake Michigan to the Illinois River at LaSalle, IL. Capt. W.L. Marshal, U.S. Eng. Ann. Rept. Chief of Engineers to the Secretary of War - Part 3, Appendix JJ, pp. 2399-2574. 1894. The ancient outlet of Michigan. Prof. W.M. Davis. Pop. Sci. Monthly, Vol. 46, pp. 218-229. 1894. Currents of the Great Lakes as deducted from the movements of bottle papers during the seasons 1892 and 1893. Mark W. Harrington. Weather Bureau Bulletin B, U.S. Dept. Agriculture. 1894. The geological survey of the Great Lakes. Dr. J.W. Spencer. Proc. Am. Assoc. Adv. Sci., Brooklyn Meeting, pp. 242-243. In this paper a cause is suggested for a temporary discharge of the upper Great Lakes into the Mississippi River. 1896. The water resources of Illinois. Frank Leverett. Seventeenth Ann. Rept. U.S. Geol. Survey, Pt. 2, pp. 695-849. 1897. The Pleistocene features and deposits of the Chicago area. Frank Leverett. Chicago Acad. Sci., Bull. 2 - Geology and Natural History Survey. 1897. A short history of the Great Lakes. Frank B. Taylor. Studies in Indiana Geography, Terre Haute. 1897. Modification of the Great Lakes by earth movement. G.K. Gilbert. National Geography Magazine. Vol. 8, pp. 233-247. This makes some interesting predictions involving the future of the Chicago area. 1897. The age of the Great Lakes of North America - a partial bibliography. Alex N. Winchell. Am. Geologist, Vol. 19, pp. ???-???. This gives many references, with a short summary of the opinions of each author. 1899. A peculiar Devonian deposit in northeastern Illinois. Stuart Weller. Jour. Geology, Vol. 7, pp. 483-488. 1899. The geography of Chicago and its environs. Rollin D. Salisbury and William C. Alden. Bull. No. 1, Geog. Soc. Chicago. 1899. The Illinois glacial lobe. Frank Leverett. Monograph U.S. Geol. Survey, Vo. 38, pp. 239-459. 1865. Enumeration of fossils collected in the Niagara limestone at Chicago, Illinois with descriptions of several new species. A. Winchell and O. Marcy. Mem. Boston Soc. Nat. Hist. Vol. 1, pp. 81-113, pls. 2-3. 1868. Descriptions of new of little-known species of fossils from rocks of the age of the Niagara group. J. Hall. Twentieth Rept. N.Y. State Cab. Nat. Hist., pp. 305-394, pls. 10-23. 1870. Descriptions of new or little-known species of fossils from rocks of the age of the Niagara group. J. Hall. Twenty-second Rept. N.Y. State Cab. Nat. Hist., pp. 347-434, pls. 10-25. 1880. Description of two new species from the Niagara group, and five from the Keokuk group. S.A. Miller. Jour. Cincinnati Soc. Nat. Hist., Vol. 2, pp. 254-259, pl. 15. 1880. Description of four new species of Silurian fossils. S.A. Miller. Jour. Cincinnati Soc. Nat. Hist., Vol. 3, pp. 140-144, pl. 4. 1880. Description of four new species and a new variety of Silurian fossils, and remarks up others. S.A. Miller. Jour. Cincinnati Soc. Nat. Hist., Vol. 3, pp. 232-236, pl. 7. 1881. Description of five new species of Silurian fossils, and remarks upon an undetermined form. S.A. Miller. Jour. Cincinnati Soc. Nat. Hist., Vol. 3, pp. 314-317, pl. 8. 1881. New species of fossils and remarks upon others from the Niagara group of Illinois. S.A. Miller. Jour. Cincinnati Soc. Nat. Hist., Vol. 4, pp. 166-176, pl. 4. 1881. Description of new species of fossils. S.A. Miller. Jour. Cincinnati Soc. Nat. Hist., Vol. 4, pp. 259-262, pl. 6. 1882. Description of ten new species of fossils. S.A. Miller. Jour. Cincinnati Soc. Nat. Hist., Vol. 5, pp. 79-88, pls. 3-4. 1897. The North American Crinoidea camerata. C. Wachsmuth and F. Springer. Mem. Mus. Comp. Zool. Harvard Coll., 2 vols., text and atlas. 1899. Descriptions of new species of Diplodus teeth from the Devonian of northeastern Illinois. C.R. Eastman. Jour. Geol., Vol. 7, pp. 489-499. 1900. The paleontology of the Niagara limestone in the Chicago area; the Crinoidea. Stuart Weller. Bull. No. 4, Pt. 1, Nat. Hist. Surv., Chicago Acad. Sci., June 27, 1900. [This section apparently finished] April, 1901 [as this date alone appeared at the end of it]. 1865. History of the Chicago Artesian Well. George A. Shufeldt, Jr. Religio-Philosophical Publishing Association of Chicago., 1897. 1884. Microscopic organisms in the bowler clay of Chicago and vicinity. H.A. Johnson and B. Thomas. Bull. Chicago Acad. Sci., Vol. 1,. No. 5. 1891. The flora of Cook County, Illinois, and a part of Lake County, Indiana. Wm. K. Highley and Charles S. Raddin. Bull. Chicago. Acad. Sci., Vol. 2, No. 1., p. 15. 1895. The classification of American glacial deposits. T.C. Chamberlin. Jour. Geol., Vol. 3. 1895. pp. 270-277. 1896. No title. T.C. Chamberlin. Jour. Geol., Vol. 4. pp. 872-876. 1898. Sands and clays of the Ottawa Basin. Dr. R. W. Ells. Bull. Geol. Soc. Am., Vol. 9, 1898, pp. 211-222. 1898. The Peorian soil and weathered zone. Frank Leverett. Jour. Geol., Vol. 6. pp. 244-249. 1898. The weathered zone (Sangamon) between the Iowan loess and Illinoian till sheet. Frank Leverett. Jour. Geol., Vol. 6. pp. 171-181. 1898. The weathered zone (Yarmouth) between the Illinoian and Kansan till sheet. Frank Leverett. Jour. Geol., Vol. 6. pp. 238-249. 1899. The ecological relations of the vegetation of the sand dunes of Lake Michigan. Henry Chandler Cowles. Botanical Gazette, Vol. 27. This ends the 1902 Chicago Folio. Bretz, J Harlen. 1939. Geology of the Chicago Region Part I - General. Bulletin 65. Illinois State Geological Survey. Reprinted, 1964 without the map plate. Chicago's First Families: Local Life until about 400 Million Years Ago.